An acid rinse (neutraliser) and/or preliminary cleaner (prewash), for use in automatic glassware washing machines. Acid rinse (neutraliser) and/or a preliminary cleaner (pre-wash), for use in laboratory, medical and industrial automatic glassware washing machines. Supplied as a liquid concentrate, for use in automatic machines. Biodegradable*, non-flammable, Bactericidal**, non-foaming and free-rinsing. Colourless, non-viscous liquid, having mild odour. A mixture of aliphatic polycarboxylic acid, aliphatic alcohol and non-ionic surface active agent in an aqueous base. Supplied in 5 litre, high density polyethylene containers, with "tamper-evident" screw-on caps. For use in automatic washing machines as an acid rinse (neutraliser) and/or a pre-wash (preliminary cleaner), when cleaning/decontaminating glassware, ceramics, rubbers, plastics, stainless steel and ferrous metals. Being acidic, Decon ACID RINSE is NOT suitable for use on non-ferrous metals, notably aluminium and zinc. Please follow the manufacturer's instructions for your washing machine and place Decon Acid Rinse into the appropriate chamber. 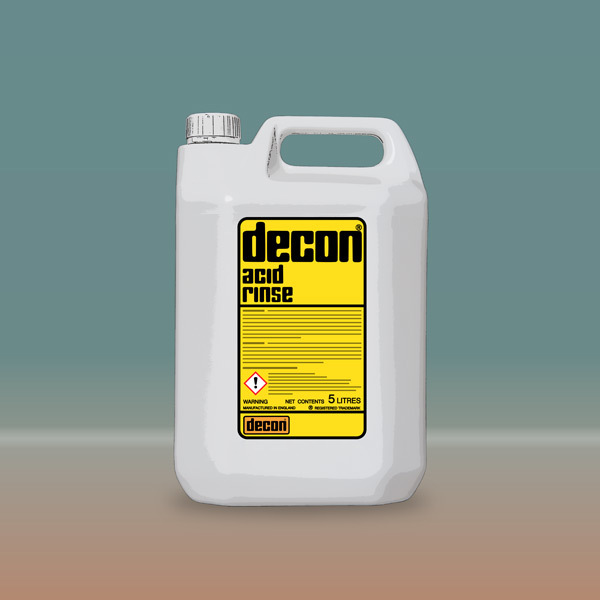 Decon Acid Rinse (Neutraliser): 1-3 ml per litre of rinse water. ** Decon Acid Rinse satisfies the criteria in BS EN 1040 1997 for bacterial activity.